MARIA COUCH 5-6-1927 Micro Film WOMAN WHO DIED NATIVE OF THIS COUNTY. News Notes of General Interest from West Salem. West Salem, Ill., April 5.-Maria E. Couch, daughter of John A. and Esther Greathouse, was born near Lancaster, in Wabash county, on June 11, 1848, and passed away at her home on South Broadway in West Salem, Sunday evening, March 27, 1927, at the age of 78 years, nine months and eleven days. On Dec. 24, 1866 she was united in marriage with Bradley S. Couch. To this union eight children were born, four sons and four daughters, three of whom have preceded in death, namely: Mrs. Sadie K. Pool, Theresa Couch, and one son, Charles Couch. The deceased was a member of the Christian church, hav-...(the rest of the obituary copy is missing). Bradley S. Couch with wife Maria E. (Greathouse) and children Maurio D (son), John W., Edwin E. from image 1900 Census Salem Precinct, Edwards Co, IL. 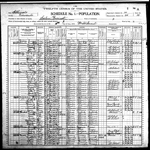 [S18728] Illinois Statewide Marriage Index 1763-1900, 401/17 Wabash.